03/28/2010: Still on track here. Scamps learned to fullscreen Dwarf Fortress and he learned that scratching my computer's case is a great way to get attention. Elsewhere in the animal kingdom, Momuz the three-eyed marmot demon fooled the humans into believing she was their skeletal goddess of death, and she took over their civilization after threatening them with violence. The town's local warlord apparently didn't like this arrangement, because he asked me, the elven adventurer, to kill her. I found her sleeping in a little hovel in the early morning and hacked her to death in her sleep, but the humans weren't grateful and tried to kill me! How rude. 03/26/2010: Fixed a crash related to vermin getting caught in cobwebs, and another series of crashes related to temperature. The conditions for the different landed nobility to be elevated from your fortress population are in the raws now, as are megabeast and semimegabeast and titan attack conditions. They can be set based on population, exported wealth and created wealth. So, for instance, if you run a low-population fort for whatever reason, you can adjust the numbers. This came up during the course of debugging the landed nobility... and it turned out the liaison was not coming back in subsequent years because the visiting dwarf lost the position upon leaving the map... anyway, that's sorted out. The current situation is that I expect a (buggy!) Windows release in about a week, with the 40d# merge commencing at that time (or within a few days of the release). This is a bit of a change of plan, since I was originally going to release for all operating systems at once, but I feel like I'm going to get even more bogged down if I don't do it this way and the initial pre-merge release will give us a control to work with in the same way that 40d can be compared to 40d#. The initial merge release shouldn't take too long though, and it will be the top priority aside from the worst catastrophic crashes and things of that nature. I know the merge changes make the game playable for many of you when it otherwise isn't. 03/23/2010: The main issue now is a frequent random crash that has appeared that I'd reeeeaaaaally like to have cleaned up -- we caught one of them just now that happened when an old mayor needed to have mandates cancelled after losing an election. There still one that happens in younger forts though. Testers are on their seventeenth version overall, and I imagine it'll be that way for the rest of you as well once I get it sorted out, bandwidth permitting. 03/20/2010: A bit of distraction from military matters -- they started walking into water 6 of 7 deep if there was an available ramp, then scrambled right back out. Milling jobs were using wooden chests and then calling them wooden bags afterward. "Skeletal" slugmen and other oddities no longer occur (you can still get zombies). I got rid of the snow display during world gen, made scorching areas available again, and added parameters and parameter sets to make worlds that are surrounded by water on all sides for people that like that look. 03/18/2010: Stopped dwarves from deciding to reverse their uniforms/clothing choices in their minds, thinking about how strange it would be to put your socks on over your shoes, and then dropping everything, including stuff they got on right the first time... various problems with training activities not clearing properly... cleaned up issues with specific bed assignments (to positions within a squad), changed the sleep schedule options around... I also ended up making reclaim civilian, at least for now, since there were too many issues with starting out a bunch of pre-made squads. This also messed up soldier migrants, but I've compensated for that by giving migrants higher and more varied skills in general, including the skills of a former soldier at times. 03/15/2010: I've answered some questions over in the List thread. 03/14/2010: Let's see... lakes were extending underground... like way underground, causing all sorts of magma trouble. Fixed an arena crash. I just need to fix up the various equipment/training bugs now. 03/12/2010: I went through the purring maggot process from animal trap capture to storing the milk in barrels in a food stockpile. Of course, the issue with this has been dwarves just up and eating the maggot at any point in the process. I changed it so that they would only eat purring maggots if they were starving and nothing else were close by. 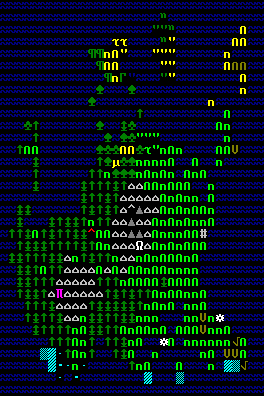 I tested the change by having the starving dwarves stand in a meeting zone with the food up in a stockpile to the north. In between the stockpile and the dwarves, a succulent purring maggot tempted from an animal trap. They performed well, passing up the maggot for other food. At the end, there were seven dwarves, five pieces of food, and the maggot. I made them starve again -- five dwarves ate regular food, the doctor ate the purring maggot, and the fisherdwarf ran downstairs, caught a live cave spider and ate it on the spot. I also handled a gremlin pathing problem and some strange things like the dwarves tanning mussel shells to make mussel leather. 03/11/2010: As usual with recent combat revisions, the results swing back and forth wildly until the result is better than the starting point -- at today's worst, a human scratched another human in half with his fingernails, but I also had a human hack off a couple hydra heads with an adamantine short sword, and the monster kept coming, which was fun. Using the instant-butcher command from the arena, we had a skull from each severed head and five skulls from the eventual corpse. In general, I rebalanced bleeding and handled some other combat problems as well. It would be cool to have the hydra heads get knocked out one by one if you box them right, but there were some annoyances with that so I'll handle it when I do brain-death later on (after this release). For now, hydras get the NOSTUN tag so they don't get KO'd by a single head's traumatic experiences. I gave them NOPAIN and rapid healing as well, for more fun. I also fixed a bug where the arena slowly heated up to just above the boiling point of water slowly over time if you were controlling an individual creature -- it came from initializing a weather variable wrong in the fake 1x1 world that the arena inhabits. 03/10/2010: I started testing out the hydra this morning and found I couldn't quite hack off its heads with an adamantine two-handed sword. While I was working through the numbers there, I got a crash report which ended up being this horrible intermittent doesn't-happen-with-any-debug-information-enabled beast I've only finished off just now, so I'll be back at the hydra tomorrow! I understand what's happening with the neck severing now so I should be able to get to testing bleeding, KOs, and so on without much trouble. 03/05/2010: The next SDL/OpenGL/etc update 40d19 is up. The download is at the forum thread here. Let us know how it is performing there. 03/04/2010: Fixed a crash from a weird combination of holding an entity position and recreating a squad and scheduling orders, and the mode in the main screen where you order squads around is finalized now, unless I add an easy order to just "defend the fortress" which seems possible. The military organization screen is next. 03/01/2010: Here's the March 1 report. A lot of the item weights were quite strange as I brought up before, so I overhauled the mass system so that things are more consistent and are at least internally represented using real world units. Tissue by tissue, my embark dwarves were between 43kg (short and incredibly skinny) and 122kg (broad-bodied and very fat). The little bits and severed pieces of arena critters are also weighed out appropriately with respect to missing parts, and trousers don't weigh a zillion whatevers anymore. Actually, the capital gamma (the weight/mass symbol) is a kilogram now, but we are still using the same symbol at this point. 02/27/2010: I fixed another world gen crash -- one that only happened with (time-consuming) optimized compilation and didn't repeat consistently (rarely, for certains seeds, and for those seeds at different years each try etc. ), having to do with how the genetic information was passed along. So that's good. Not so good was Scamps's latest fun idea. His favorite toy to play fetch with is the stuffed hamster/rodent thing with the fur chewed off that I mentioned before, and we did a few throws in the early morning while I was working on the crash. The third time he brought the toy, I picked it up by a stubby back leg and threw it out of the room as usual, but this time I was greeted by a spiral of water... quite a lot of water. It seems that right after the second throw, he took the toy out to his water dish and soaked it before bringing it to me. There's no way for the second throw itself to have bounced and hit his water dish since there's too much wall in the way, and I confirmed that his water was lower and had been splashed around the floor. And it's not like there was a lot of time between the throws... he just chased the toy, brought it to his water, got it wet and brought it back pretty much. A troubled boy. I'm kind of afraid of his next plan. 02/26/2010: Fixed a crash on the military screen, fixed a problem with arena items disappearing, reorganized the attribute descriptions a bit, made some adv mode keys work that weren't working, fixed some broken ramps in caves... I took all of the old underground features that no longer exist out of the site finder, though I didn't do desired updates there yet. There was kind of a violent explosion of boiling human blood when I was testing a human vs a magma man in the arena... it was a little weird, but I guess that's okay. 02/25/2010: Sieging humans brought some war polar bears, and one of them started a camp fire. Highly trained! 02/24/2010: Science in DF was the runner up for the topic of the last DF talk, so we are holding a science specific poll here for the next talk. Vote for your favorites! Here's a List thread reply (2/22/10). Cleaning progresses. Another poison crash and other problems with poisons, stopped the bronze colossus from blowing out some combat variables, fixed some problems with entity material selection, added plaster trading, fixed issues with flying item thieves, slowed down skill/att rusting a bit, some designation coloring and other display issues... The animal people will now dip their darts in whatever nasty stuff they can find down there, instead of just venoms from bites and stings. So any poisonous liquid/dust breath, poisonous secretion or poisonous blood that is around in their cavern will be used. 02/22/2010: The next SDL/OpenGL/etc update 40d18 is up (Mac too!). There are still some adv mode errors and so on -- the important thing we are checking is the general FPS, since the other problems just have to be worked through on the main merge anyway. Votes in the poll and comments are helpful. You can grab it at the forum thread here. The missing DF talk segment is up on the DF Talk page with download and transcript. Main-release DF issues continue to be worked through as well. 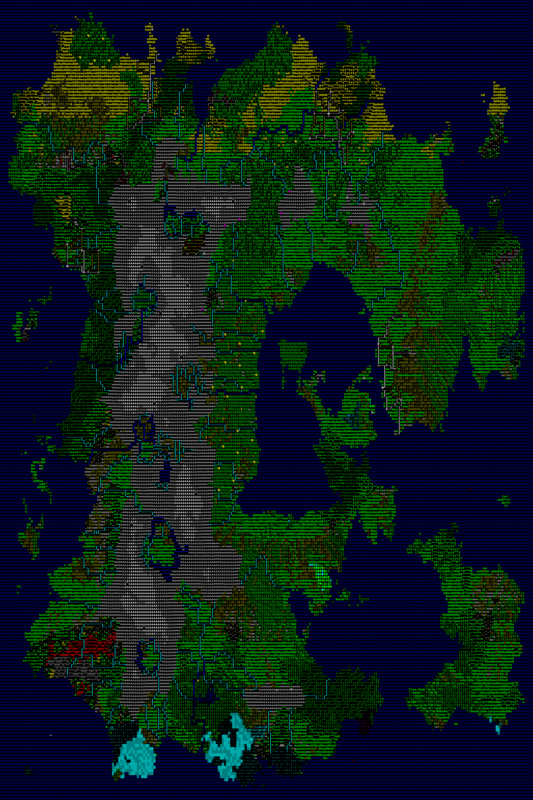 World gen crash fixed, various complaints about the military controls addressed (lots left there). It also called not-yet-placed doors and other buildings "unknown frozen substance doors", which wasn't correct for things like wood or anything else. I'm trying to catch up with the future of the fortress questions, but they are outpacing me recently, he he he. I think I have about a dozen replies left to do. 02/20/2010: Non-programming bug to report: I know a lot of you were disappointed by the latest DF talk. I was sort of confused by the specific complaints at first, but I actually went back to the transcript today and found that somehow I only managed to send 6 of the 7 recorded segments over to be edited. The missing segment? A 27 minute file starting with "All right, so now we're going to talk about the future of the artifacts", which was the main draw of the talk for pretty much everybody. Sorry for not catching my mistake sooner! The file is intact, and we'll try to get that together promptly. We still had DF bugs to go around. Liaisons had been hanging out doing nothing, staying in some fortresses for years before moving on, but not all of them. After a bit of poking around, I found that one of the liaisons that chose to linger was in fact trying to meet with a batman blowgunner far underground. Apparently any creature that was around on the map before the dwarves that wasn't a historical figure was thought to hold every responsibility for every civilization, including receiving diplomats. The new animal people camps created this situation. I recently updated the material values in the raws, but it wasn't working out. This is because, despite my attempt to select every material, it only affected the last material on the list for a given creature. So while dragon teeth were virtually worthless, dragon pus was like creamy gold. Infect and collect! 02/18/2010: Apparently in my previous testing, I haven't had a dwarf with a splint that had time on his hands. Usually they'd get their splints and then run out of the hospital zone and do their work or grab a drink or whatever. The latest dwarf, an idler, threw his splint on the ground immediately because it wasn't part of what he expected for his normal clothing and because he didn't think his arm was broken at all. He also threw his wound dressing on the ground. Fortunately he didn't pull out the sutures. That's all fixed. I also fixed a mood bug that was making them go to the work shops and yell "I must have items!" instead of being more specific. And the hospital wasn't storing as much stuff as possible in its chests, because it thought spider silk hidden down on levels deep below had already claimed the storage space for raw spider silk suturing. 02/17/2010: Humans stopped using wood at some point in there and were paranoid about building their homes on top of cavern features far below the surface, so I helped them out there. The first food store I walked into was selling yummy firefly brains, so that still needs a little work. I forgot to set the boiling point of the gas inside the body of a floating creature, so the poor thing died with the message "<name> has condensed." The former gas was in a puddle. You'll still be able to get this to happen if you lure them out of the caves onto a glacier. The feature layers also weren't taking into account the local erosion elevation drops from rivers, so occasionally a stream bed would be floating in the sky above underground features and cave-ins would happen immediately, leaving little spikes of stream bed where the cavern's columns and walls had been. 02/15/2010: Finally handled a world gen crash that has been a problem for a long time. Earlier I stuck some blind cave fish men (yes, be prepared) in the arena to try them out, and they wouldn't do anything but wander around. It was frustrating, but after a bit I remembered that they didn't have the EXTRAVISION flag. Then it was fine! 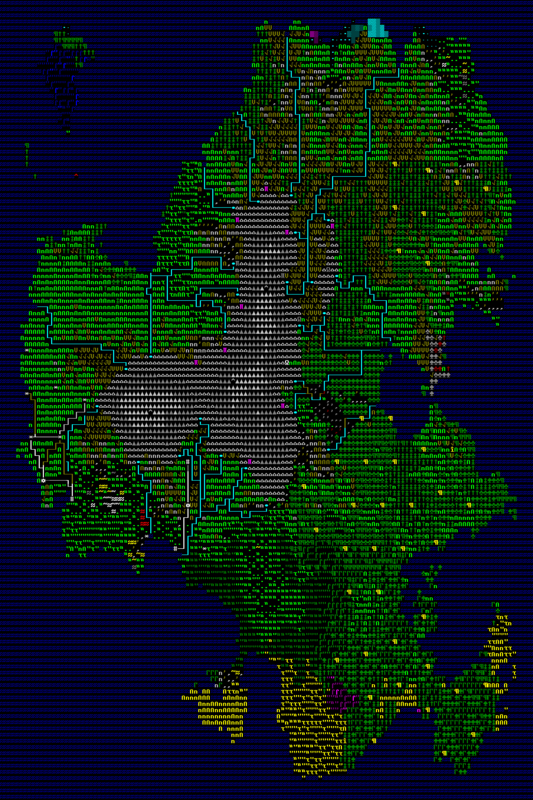 02/14/2010: Here's Dwarf Fortress Talk #7, covering artifacts: forum thread,DF Talk page with download and transcript. 02/13/2010: It's 10:30 AM now, 26 hours after the last entry... so I'm going to go ahead and start marking the dev log with the day that it actually is instead of the day that I woke up on. There is less math that way. Zach tested out windmills and dye, taking a dimple cup farm up to trading blue trousers to the elves. It all worked, surprisingly enough. Poisons had some lingering errors, which I worked on in arena mode for a while. Two crash bugs fixed up there. I made a creature earlier with a poison that gives you H1N1, basically, and there's apparently a bug with fevers... they never go down, even after the illness itself leaves the system. 02/11/2010: Ha ha, it's 8:30 in the morning again... I should figure out a way to write the dev log halfway through the day, with a time machine or something. Anyway, some stuff works better now. Glass even worked on the first try. 02/09/2010: Today we wanted to see how the hospital zones worked out over there in a real fortress environment, so Zach took his fort and made a dwarf-dropping device. After a few false starts, we got a dwarf with a compound fracture in his left hand. One of the caretakers wanted to clean the dwarf off but kept dumping the water next to the dwarf, over and over. Once that was sorted out, surgery began. The dwarf Zach had selected didn't have any surgical experience. As I was watching, blood splattered on the walls and floor, and another dwarf ran over to diagnose the patient again, while the dabbling surgeon moved between repairing the compound fracture and trying to stop bleeding from malpractice. Eventually it was time to suture up the wound, and the dabbling surgeon did this... then again... then again... our poor patient had four sutures in his left wrist before I got the bug figured out. Bandaging worked out fine, but I had screwed up the meal requests for patients that can move under their own power, so while the patient was waiting for a splint to be constructed in the workshops the caretakers left him to die of thirst. I got the splint together just in time, the caretaker put it on correctly, and the patient jumped out of bed and ran to get a drink. Scamps received many toys today. We have a few more toys to give him on each of the remaining days of the week. He enjoyed them very much, but when it came time to play fetch when I was working tonight, he brought his favorite old toy (which has a lot of its fur chewed off, especially in the throat area). 02/08/2010: There's a List thread reply here (2/8/10). One of Zach's horses was savaged by a nightwing and succumbed to infection two months later. It didn't go much better down below, where one of his dwarves was taken carp-like from the top of moat by a gigantic beast. The kiln was busted, and now it's not. Some problems with hospital item storage came up. Zach also found some pigtail trousers that weigh twice as much as a bin of pigtail cloth. Scamps turned one today! When we weighed him, he was fourteen pounds. The birthday party is actually a five day festival (during which I'm still working), and he'll be receiving his gifts tomorrow. 02/07/2010: One of the fun new things down below has some critters in it, but it's not as fun if the critters are set to be wilderness creatures and so eventually roam off of the map, leaving the fun new thing completely empty. That's fixed now. Brewing stopped producing seeds apparently, and Zach had to turn to the underground critters for food. Brewing is fixed. Some job material problems that left products without materials were fixed. I'm also working through some ammunition and equipment problems. I've been balancing about halfway between stuff I had listed from before and stuff that has come up in more recent testing. 02/06/2010: Zach set up a little fort in part to try out the clothier's shop, well use and the supposedly fixed caravans. There was an accident during the well digging, and a couple of dwarves drowned, but the well worked out in the end. The dwarves couldn't recover one of the bodies but they set aside a casket for him. The caravan arrived properly and Zach traded away the other dead guy's clothes and some rock toys for pigtail and cave spider silk cloth. The clothier was completely busted (the buttons just stopped working), but I managed to clean that up. With the immediate goals checked off, the digging projects moved deeper to test some endgame stuff, but a large underground beast managed to get into one of the stairwells and there were further deaths. In the meantime, I cleaned up some bugs with the raws, including some trees that dropped gray wood. 02/04/2010: The next SDL/OpenGL/etc update 40d17 is up for Windows and Linux. Mac has been delayed a bit over some library issues. You can grab it at the forum thread here. That thread can also be used to provide feedback. Remember that this is not the next major version of the game. 40d17 itself is fairly buggy itself due to a massive rewrite that had to be done to support the new input system, but that's what the thread is for. Hopefully it'll all be worked out by the time of the merge. 02/03/2010: I fixed up pack animals and an overall lack of minerals on the map, and 40d17 is alllmost ready. One of Zach's dwarves grew attached to his trousers. Then all of his military dwarves decided not to drink and died of thirst in the barracks while training. Then it crashed. The work continues! 02/02/2010: Zach played around with a couple of forts today. In the first one, he broke through the rock and found he was in a huge pillar surrounded by an underground lake, so he dug out a shelf and a stairway down and then bridged over to some mushroom-farmable land on the other side. There was some bizarre table dancing where they'd drop and pick up their food while slowly eating it. Then it crashed. In the second game, he had some werewolf trouble on the surface. It tore his fisherdwarf's head off and after he organized the other six dwarves to attack, his carpenter and another dwarf were killed. The survivors couldn't clean themselves up because the pond water was too bloody. One of the reasons for that was the carpenter -- when he had sorted things out and went to look for the bodies later on, Zach found his rotten corpse down there. After the fight, raccoons invaded the scene and stole shoes and gloves from the field. There were only four dwarves left, and hoary marmots began wandering the fort freely. He had been at the site for a year, but strange bugs with pack animals caused caravans and migrants to be shut off, so he wasn't getting anybody new. I've got that bug reproducing now, so I should have it sorted out tomorrow, hopefully. As I'm writing this dev log entry, Zach's current project is getting the pond drained to reclaim the skeleton. I'm also working on the last bits of the 40d17 stuff (not the merge, just the next test release). 02/01/2010: Zach's glacier tiles disappeared as he dug staircases, so he ended up taking apart his wagon to build a staircase down to the rock. There was a lot of fighting with wolves, and the kill order mostly worked but it kind of acted strange, and eventually he got a crash on the military screen. On the other hand, I fixed a crash with liquid spilling out of certain unsolid creatures, the problem with booze being ignored and some of the others. Cats and dogs had four mysterious unattached fingers that moved with them (just four in total, and they had all of their normal toes, front and back) due to an extra tag. I added some more raw error logging there to detect body tags that don't get attached properly. 01/31/2010: Here's the February 1 report. Zach assigned axes to a couple of different dwarves and commanded them specifically to kill a crocodile and a giant toad that were tormenting his civilians. The missions were successful, but the toad had already killed two civilians. They were laid to rest in pieces in their coffins. A sever bug caused those pieces to be somewhat ill-defined as "partial remains" instead of the specific parts. I'm testing the fix for that right now. We also solved the mystery of the crash that has been plaguing him the entire time. Apparently when critters came wet out of the water and attacked people, some of the water transferred over and cleaned off other spatter on their victims' inventories, and that routine wasn't written correctly to handle the near-simultaneous adding and taking away of inventory spatter. I think it's the same as an intermittent crash bug I've been having for months but could never reproduce reliably, so I'm happy that one is out of the way. 01/29/2010: Zach found a cave crocodile and his miners were also harassed by multiple -redacted-... and meeting zones didn't work. I'm not sure exactly what sort of civic project he was working on, but a room ended up flooded and he built something involving a lever trying to get the room dry again. One gremlin showed up but he chased it off. Then he found some problems with the Z status screen. He also set up a magma forge and a magma smelter and got a gold operation up and running down in the depths. Then it crashed. I finished some of the lingering 40d17 problems, and I may or may not be back to regular work tomorrow depending on if I'm needed there again immediately. 01/28/2009: Be taken away by Snatcher, a new Threetoe story. It has been posted up in the story section and there's a forum thread as well. Let's see, Zach's dwarves insisted on drinking from a pond instead of drinking their booze, but he managed to melt a dwarf with magma and have the rest killed by underground beasts within ten minutes, which is positive. Adventure mode was kind of a mess on the other hand... he somehow started with a complete set of adamantine equipment, with which he couldn't injure a mob of leatherclad villagers despite my testing a similar scenario in the arena mode. I didn't ask him why there was a mob after him. Prior to that, they sent him to find a demon at a vague location to get a quest... dunno if that was a bug or not, since I haven't checked the legends. Anyway, more to do. 01/26/2010: Okay, we've got a handle on the big 40d17 issues, but it'll still take some coordinating. I'm also working on getting an ugly crash-test copy out to Zach, for which I have to iron out a few of the weird game-breakers so he can even try it (like, why are the dwarves all moving at 1/3rd speed now even when the FPS is fine? ), and then I should be back to the march toward the main release. 01/24/2010: I've organized all of the remaining notes... massive but contained. I should have everything I need to get 40d17 up, so I'll be doing that tomorrow hopefully, then I can move on to the hydra testing. I'd also like to get the list thread questions up tomorrow or the next day. I'll post a link here when it is done. 01/23/2010: For rope ladders/etc., I didn't want to tackle the two big issues there (pathing and multi-z buildings), so I went ahead with the quick fix, which is allowing you to build stairs most places, including down into an open area. When I get around to the proper solution, that ability will likely be removed. In any case, the underground is complete. There's still a lot left to do, and I'll be all over the place fixing this and that, but I shouldn't be adding anything else giant and new that will further slow things down. There are a ton of "test this!" and "do this for this person" notes lying around, and I've got to go through all of that and plan my route to a release. 01/22/2010: Fixing issues with cave ramps took four hours longer than I expected, but I managed to get them working, as well as all the magma features and drainage problems I know about. This leaves one day to play around with the deep stuff, and then I'll be to the last part, the ladder issue, which I may or may not do something with. So the underground stuff on the list should be greened out in a day or two. For a while now, Scamps has consistently rolled on to his back and stretched out whenever I go into the kitchen. He meows once then waits. He isn't begging for food -- he just wants me to go over and rub his belly. This is called Tummy Time. 01/20/2010: I'm staring at less than a page of notes for the underground now, so I could be done with that by Friday, which would be nice. The plant growth stuff is all working out, so things like giant tower cap farms should be feasible, once you break into a spore source for them. The adventurer can interact a bit with the underground, and it might happen away from sites like caves and old fortresses, so I had to create weird invisible sites to store the changes permanently (not mining yet). There were also a bunch of spatter display problems I fixed. Next I'm doing tweaks to cave openings and handling some problems with magma pools and internal volcano generation involving water layers draining down below into the magma and so on. 01/18/2010: I've been working on the laundry list of map tweaks for the underground. Next up is testing out underground plant growth over the course of a game, especially as it relates to player-expanded caverns. Scamps hit 12.5 lbs, he's still skinny, and not yet one year old. Maybe he will be a megabeast after all. 01/16/2010: The topic vote for DF Talk #7 is up, and voting closes Saturday afternoon (on the 23rd). 01/15/2010: Okay, the underground life checks are done. Gas/liquid leaks from internal tissues of those kinds, getting them to exit the edges of the map correctly underground (there was a little bit of underground monsters running up out of available stairways to exit from a surface edge, but it was mostly okay and should be fine now), checking up on the new titans, etc. 01/14/2010: I'm hoping to be through with all the life-related checks for the underground tomorrow, which would leave the map-related stuff and that rope ladder issue. 01/12/2010: I've been steadily working on the email/private message backlog from the holiday illness. I have 25 emails and 15 PMs left, so hopefully I can have those boxes empty soon, in case you've been met with silence lately. I didn't end up with a lot of time, but I got to testing out gremlins as well as making sure that the curious beasts (beer guzzlers, item thieves, etc.) work out deeper down. The gremlins made a few runs on the caged dog I set up as bait for them (they wanted to spring the dog loose), creeping up three underground layers worth of stairs I built for them. 01/11/2010: I finished up the lingering underground civ issues today -- how they are listed in the civ screen, an issue with how critters that become notable are linked to the underground civs, that sort of thing. 01/10/2010: The transcript is up for DF Talk 6. I messed around with underground populations a bit more. I also used the new locations associated with announcements to turn off all of the combat spam in adventure mode for events that your adventurer can't see. Later we'll need some general sound announcements for those, perhaps, but collapsing them down to something concise is more than I can do this time around. I should be done with underground civs tomorrow. 01/09/2010: Ran through some underground invasions, fixing problems as they arose, and did a bit more with underground entity population regulation over long periods of time. 01/08/2010: I fixed up some body problems with the new critters and tweaked some of the combat stuff relating to size. I still had dizzy-breaks and my-eyes-are-sore breaks, but it was a lot better than when I tried this earlier this month. 01/07/2010: I think I'm mostly back together now, so we should have regular development logs again since there will be development again. Here's Dwarf Fortress Talk #6, covering adventure mode: forum thread,DF Talk page with download.